10 Good Reasons We All Need to Drink Water We all hear “Drink more water!” If you were lucky, your mother taught you the importance of this early in life. If not, well, it’s never too late to get on your water kick! It really is that important! Below you will find 10 great reasons to incorporate this liquid into your body on a daily basis. Establish times to get a fresh glass of H2O throughout the day. Exchange that soda break for a bottle of water break. Drink water before and/or with your meals. These are all easy ways to make sure you are getting enough water each and every day. 1. Water is the basis of life… Life cannot exist without water. We must stay properly hydrated in order to enjoy good health. We can go weeks without food but only 3 day without water! 2. Our bodies are made up of 70 – 80% water… Water flows throughout almost every part of our bodies. Our brains are almost 85% of water while our blood is 92%. Our muscles are 79% while our bones are 31%. Just how important do you think drinking good water is for you? Extremely important! 3. Good water… It is imperative that we are drinking actual water to hydrate our bodies. What I am saying is, “It is important to note we should not consider sodas, coffee, alcohol or teas as a way to hydrate ourselves”. Coffees and teas are actually diuretics which may cause excess urination so they deplete our bodies of water. Mineral rich,high alkaline water is best. You can read about how easy it is to turn your tap or bottled water into a great source of alkaline water @ www.SangoCoralLife.com. 4. Body function… Water is key for our body to function at its best. Dehydration is the #1 reason for daytime fatigue. A mere 2% drop in body water may cause trouble focusing, a headache, or the wrong choice in a minor or major decision that you must make. Are you beginning to get the picture of just how important water is for you? 6. Digestion… Proper digestion is directly related to hydration. Water transports our food. Carbohydrates and proteins that our bodies use as food are transported in our bloodstream by water. Water is also necessary to help carry the waste from our bodies. 7. Toxin Removal… Our bodies all contain toxins that drinking water will help remove. Our digestive tracts all love when we drink enough water! Water will also curb your appetite and help your body metabolize stored fat. So it is safe to say water intake could help reduce fat deposits while drinking less water could help cause fat deposits to increase. 8. Chronic Dehydration at the Cellular Level… This problem is more common than we would like to believe! If one fails to drink enough water and is in a constant dehydrated state at the cellular level, the body’s overall immune system can become weakened. This could lead to nutritional, chemical and pH imbalances that could then become the beginning of acute or chronic diseases. 9. Your Body’s Cooling System… Water is the way in which our body’s systems are regulated for the most part. Many people will drink sports drinks before and after exercising, especially in excessive heat. Most experts believe water will do a better job for these athletes than the carbonated and sugar filled drinks that are used by many. For instance, if you drink 12 ounces of a 10% sugar filled drink, less than 1 ounce is absorbed within 15 minutes. Whereas, if you drink 12 ounces of plain water, 8 ounces of this liquid will be absorbed within the same 15 minute period. 10. Dehydration Can Happen Year Round… Dehydration does not only happen in the heat of the summer but year round! In the winter months, our bodies can become dehydrated quicker than in the summer months due to people being inside, exercising less and not thinking about keeping themselves hydrated in general. When one is dehydrated, they will also tend to eat more… thus people will put on that “winter weight”. You may be wondering, “How much water should I be drinking each day?” A good guideline to follow is to drink one half of your body weight in ounces. Try this for one week and then continue on to your second week. This routine will get easier and you will find yourself drinking the water that your body so desperately needs. It will become a healthy habit! Energy levels should increase. If you have been having headaches from dehydration, these should also improve or stop altogether. 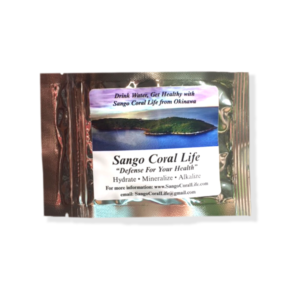 For more tips on water intake and drinking the proper water, go to www.SangoCoralLife.com.